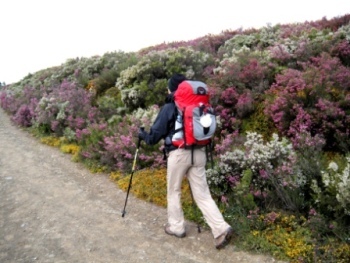 It seemed like every slope wanted to vie with another for the most color and variety. 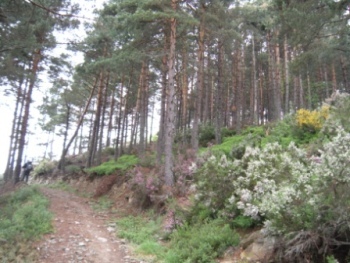 We were truly walking in God's Rock Garden. 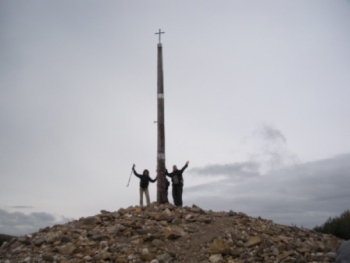 When we reached the Cruz de Ferro (the highest point on the Camino, at 1,505 m.), we knew that we would be able to finish. 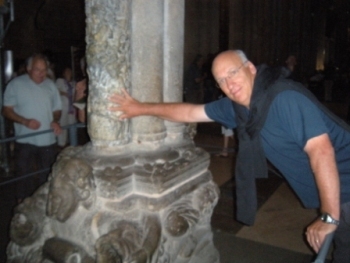 We followed a Pilgrim tradition when we each placed a stone, that we had carried with us from our Hot Springs property, at the foot of the cross. 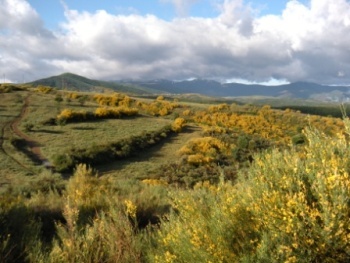 with snow-capped mountains in the background. 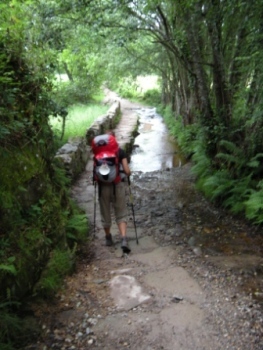 Some of the trails were so narrow, we weren't sure if we were on a cow path or the Camino. 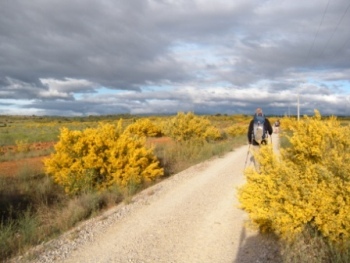 Then we'd see some cow pies and would know we were sharing the same trail. 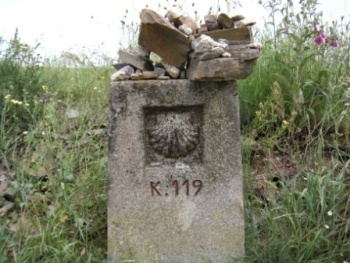 The cities along the Camino were proud to be part of the historic route, and displayed shells and other symbols of the Way to St. James. 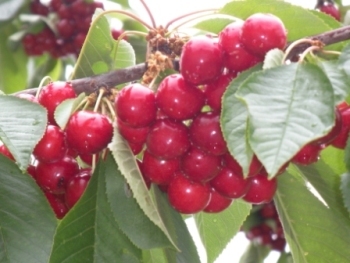 The Bierzo Valley was full of cherry trees with ripe fruit draping over our path. YUM! 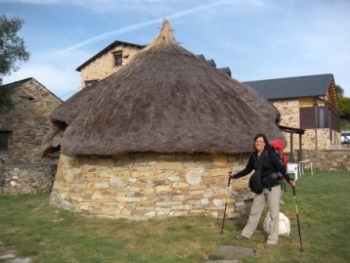 We started seeing pallozas (straw-covered huts) when we reached the last province of the Camino - Galicia. 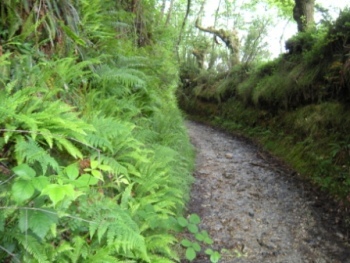 and we were almost always on wet paths. 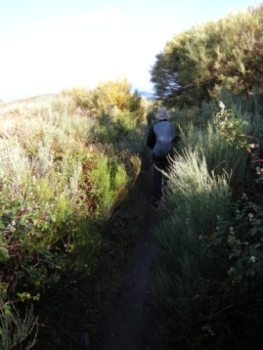 Sometimes we walked through stream beds. 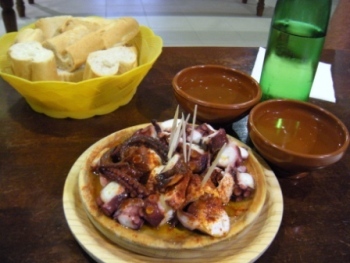 Octopus is a popular dish, and we drank the local white Ribeiro wine from wide clay mugs. 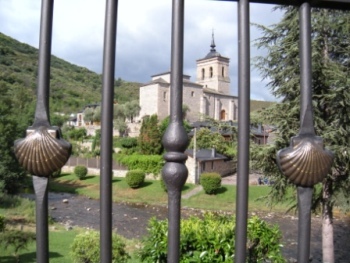 The village of Arzúa produces a soft round cheese that we loved. 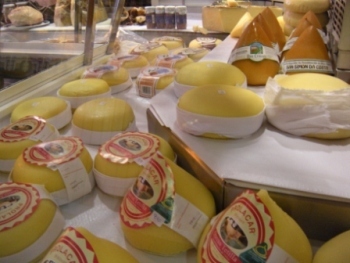 The tetilla cheese (that looks like Hersheys kisses) is popular all over Galicia. 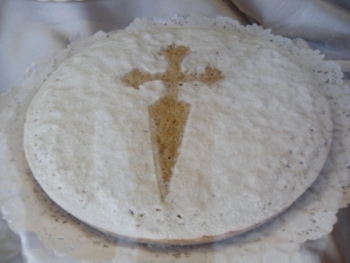 Tarta de Santiago is the most famous dessert and the Cross of St. James is shown on each one. 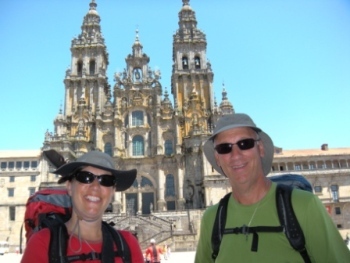 how much farther it was to Santiago de Compostela. 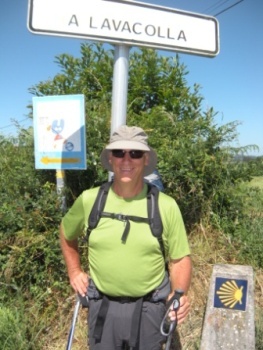 Paul had to get his picture taken at Lavacolla (the name means "scrotum wash"). 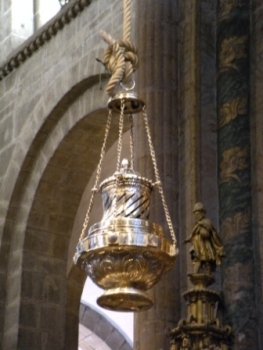 This town was traditionally the place where the men would "clean up" before entering the Cathedral of Santiago - 10 km. away. 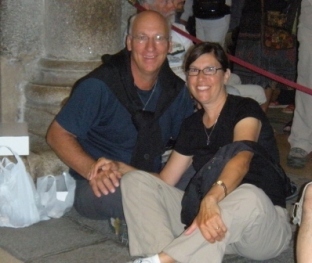 have touched to show thanks for their safe arrival and their unity with Jesus Christ.. 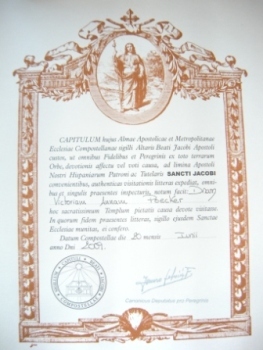 These are our Credentials. 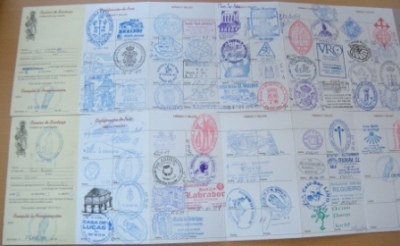 Each stamp shows the place and date. 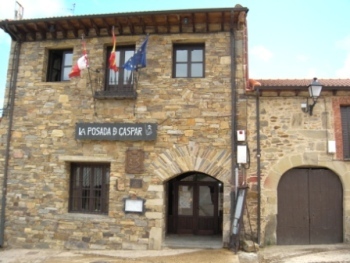 The Pilgrim's Office verifies that you continued on the Way and completed at least 100 km. you have made a commitment with God to help Him build His Kingdom. so it was probably a good idea. 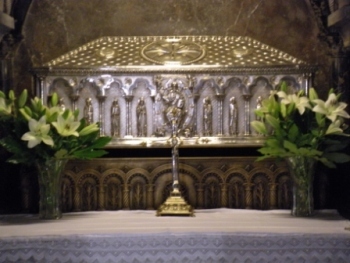 The tomb of St. James is located under the main altar. 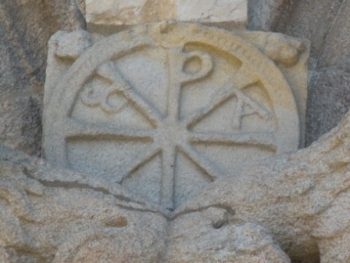 with Christ for the rest of our lives. 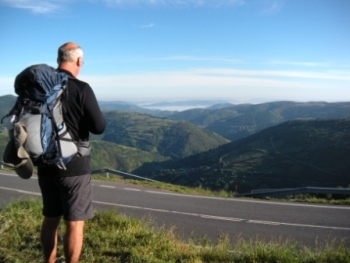 Read our BLAB to learn more about the end of our Camino Adventure.